According to family lore Cass Sunstein,shown right, escaped to the United States from his native region on the Polish-Lithuanian border by being smuggled out in a stack of hay. After settling in Pittsburgh, neither Cass, nor later his son Abraham, ever sought to avoid detection. Rather, as Pennsylvania whiskey wholesalers and distillers, the Sunsteins became bright lights of the trade. Cass Sunstein was born in 1843 in Sulwalki, a town in northeastern Poland that was an area of constant struggle between the forces of Russia, Lithuania, and Poland. He came from a distinguished Jewish family and was a descendant of Vilna Goan, shown left, a famous rabbi who was a leader of non-hasidic Jewry and known as “the saintly genius from Vilnius.” Cass’s parents were Edith (Silverman) and Noah Sunstein As he grew up, Sunstein shared the resistance among the youth of Sulwalki against being conscripted into the Russian Imperial Army. He determined to leave and was smuggled out by friends. 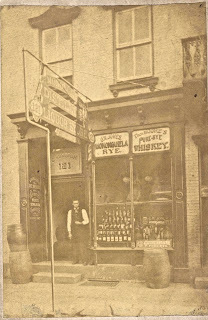 After his arrival in Pittsburgh in 1866 or 1867, Sunstein may have found work in one of the many liquor houses in that city. During this period he also took time to become a naturalized citizen of the United States. 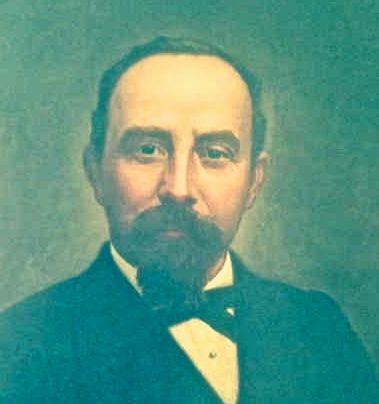 Still in his 20s he first surfaced in business directories in 1870 as a liquor dealer on Pittsburgh’s Main Street. 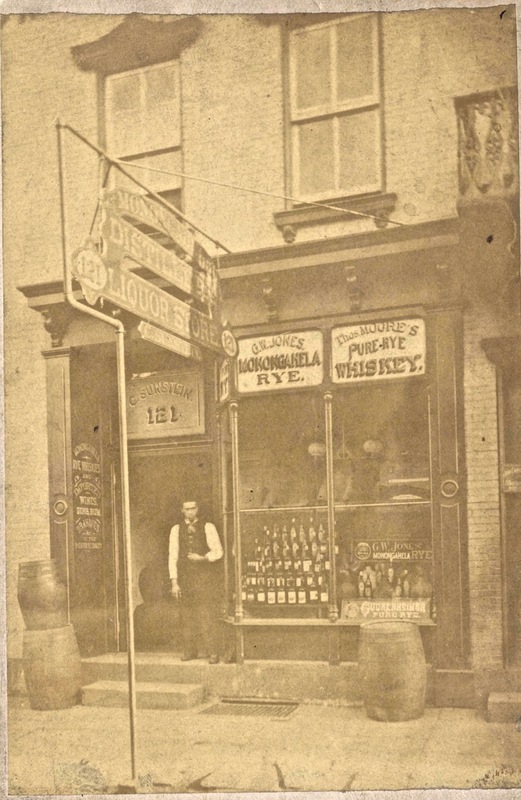 A photograph shows a young man, likely Cass, beneath a sign that says C. Sunstein and the address “121.” Note the advertising signs, several labeled “Monongahela.” Sunstein strongly featured Pennsylvania rye whiskeys throughout his career. Among Cass’s incentives to succeed was the need to bring his wife, Tillie (Shapiro) Sunstein — also related to Vilna Goan — to the United States, along with their four children, Abraham, Meyer, Solomon and Nellie. The family was recorded arriving in 1870. The Sunsteins lived briefly on Wylie Avenue in Pittsburgh’s Hill District before settling in what is now the West End. Shortly after that move Tillie Sunstein died. Likely wanting a mother for his children, Cass married soon again. She was Rose Fink, a woman 13 years his junior and, like him, an immigrant from Sulwalki. Cass and Rose would have four children of their own, Daisy, Elias, Leon, and a child who died in infancy. The couple is shown here in their later years. In addition to being whiskey wholesalers, the Sunsteins were rectifiers, that is, mixing and blending whiskeys to achieve a particular taste and color. 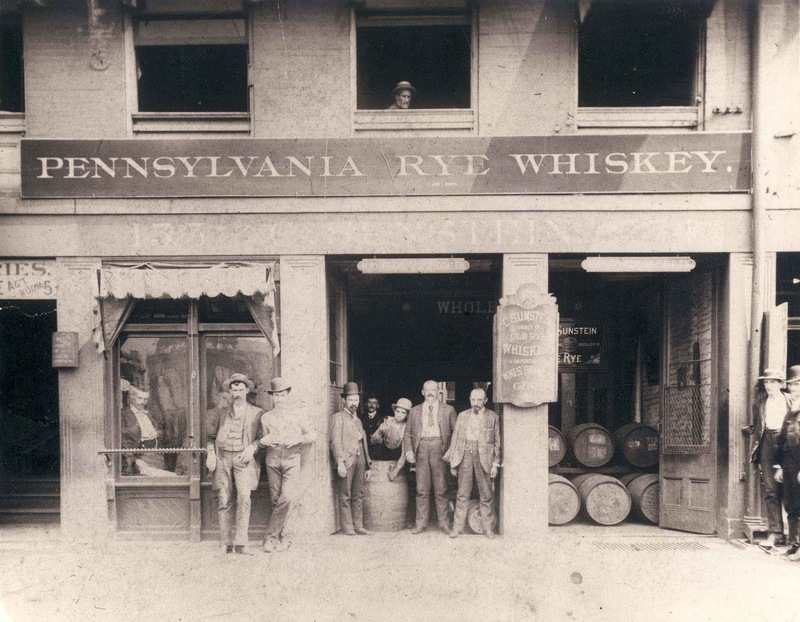 Among their proprietary brands, were "Aliquippa Pure Rye,” "Bald Eagle,” "Golden Crest Rye,” "Old Yough Rye,” and "Unexcelled Pure Rye.” None of them were ever trademarked. Shown above, the facilities Sunstein bought consisted of three large brick warehouses, one of them eight stories high, the distillery itself, and several out buildings. The plant had the capacity to produce fifty barrels of whiskey a day. Warehouses, ventilated and heated by steam, held 36,000 barrels for aging. An adjacent storage house had capacity for 50,000 bushels of grain. Sunstein subsequently added a drying house where the spent mash could be prepared for animal feed. Thompson had employed a master distiller named Doheny whom the family wisely kept as the plant supervisor. 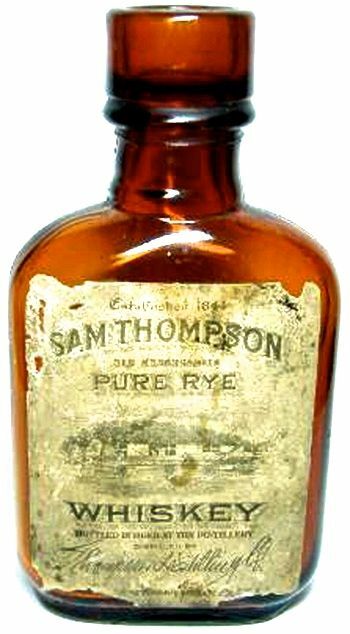 Under the leadership of Abraham, known as A. J., the Sunsteins earned a national reputation and clientele for Sam Thompson Pure Rye. Attaching attractive labels, they sold it at retail in flask and quart sizes. Eventually the increased business demanded even larger space for their Pittsburgh offices and the company made its final move in 1895 to 317-319 First Avenue. 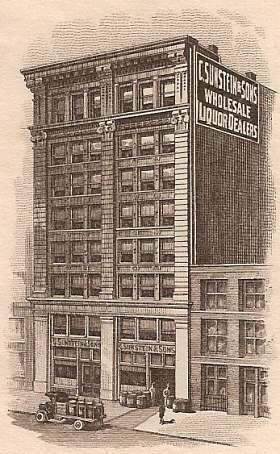 Shown here, the building boasted eight stories and a giant painted sign announcing C. Sunstein & Sons. As he aged, Sunstein ceded more and more authority to his sons, particularly to A. J. who rapidly gained a reputation for himself as a whiskey man. 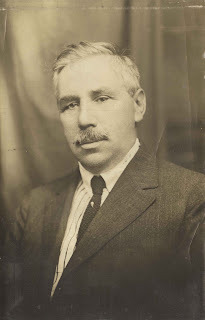 Another son Meyer worked as a clerk in the operation. In April 1913, Cass died at age 70, the cause given as acute pneumonia. With his widow, Rose, and his children gathered at the gravesite he was buried in Pittsburgh’s West View Cemetery. The family monument is shown here. Cass’s gravestone is fourth from the left. Meanwhile A.J. Sunstein was making his mark. 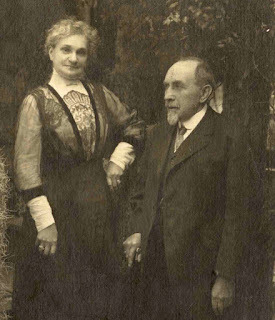 In 1887 he married Nora Oppenheimer, the daughter of an early settler in Pittsburgh. They had two children, Tillie and Alexander. Recognition of his business acumen led to A.J.’s election in 1901 and 1902 as president of the National Association of Distillers and Wholesale Dealers, afterward serving on its executive committee. He also had multiple terms as president of the Distillers Association of Pennsylvania. Out of this experience A. J., shown here, was selected as the spokesman for the rectifiers of America when challenged by the bourbon and straight rye distillers of Kentucky and elsewhere. With the passage of the Pure Food and Drug Act in 1906 those forces had gained an ally in Dr. Wiley, chief administrator of the Act, for the argument that rectified whiskey should be labeled “artificial.” When a Whiskey Commission was appointed by President Theodore Roosevelt in 1908, Sunstein was chosen to put the case for the rectifiers. While balking at the notion of “artificial,” he was willing to allow such liquor to be branded as “redistilled whiskey,” “recified whiskey” or “neutral whiskey.” In the end no compromise was necessary: all whiskey remained simply whiskey. Although A. J. Sunstein opposed National Prohibition, he seems to have understood its inevitably. Two years before it was imposed, he shut down the liquor house his father had founded 48 years earlier and turned his attention fulltime to philanthropy. 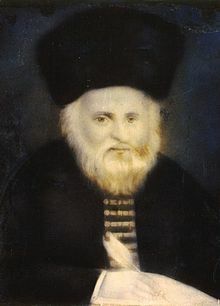 He was particularly active in Jewish charitable causes including serving as president of the Montefiore Hospital in Pittsburgh and trustee of the National Jewish Hospital for Consumptives in Denver, Colorado. 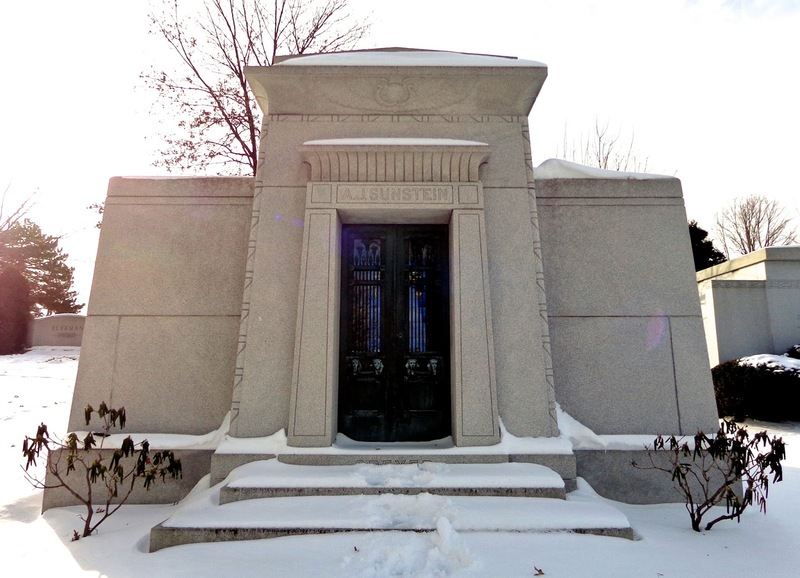 He died in December, 1926, and was interred in a mausoleum not far from the Sunstein family plot. Thus ended a family saga that began with the descendant of a famous rabbi leaving his family and being smuggled out of Poland to a New World of opportunity where the Sunsteins could demonstrate their brilliance as whiskey men.